So what do you do if you have an open air, sea water swimming pool and the bank holiday turns up cold and grey. 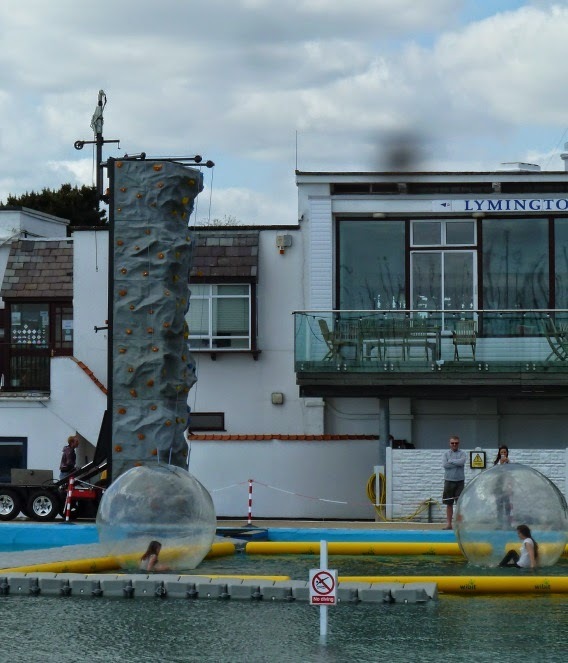 I guess issue the few hardy bathers with wet suits, but credit to the folks over at Lymington, if it's too cold to swim you can always try walking. I seem to recall these from the 1960's, but what a great idea and pretty safe location for it as well, no risk of being blown out to sea or swept off on the tide. 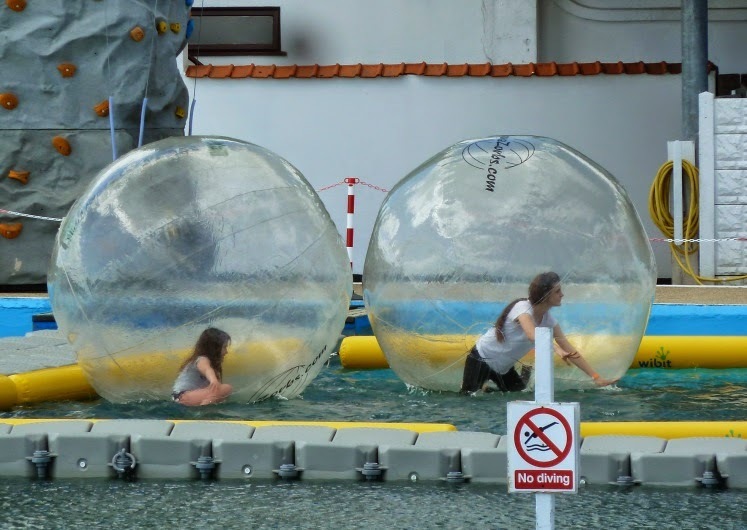 Not content with water walking, a climbing wall has also appeared at the pool side, it wasn't in action when we passed and I have a suspicion those health and safety folks might object to it being used as a diving board, but great idea. 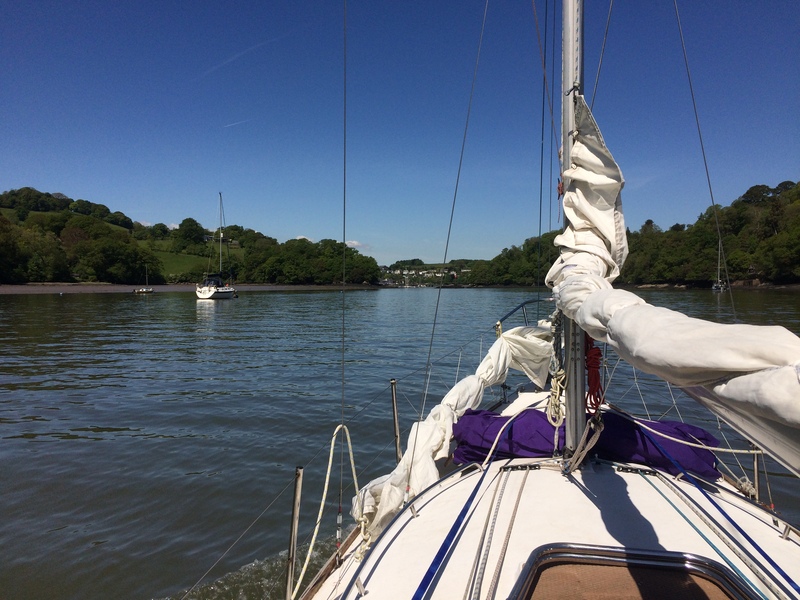 We'd been lulled into believing that summer had arrived early with the recent spell of fine and sunny weather, but inevitably come the time to go sailing it was cold and slightly wet. Joseph was first up with the cadets, actually the weather wasn't that bad, light winds and quite warm despite the grey skies, we'd just been used to better. 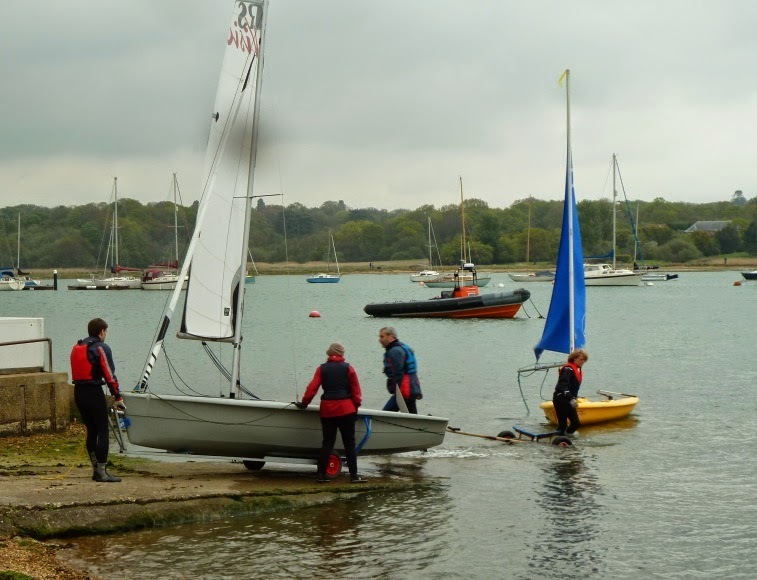 We set up a bunch of Opti's and then the cadets were towed off to nearby a creek by Hamble Common to practice. 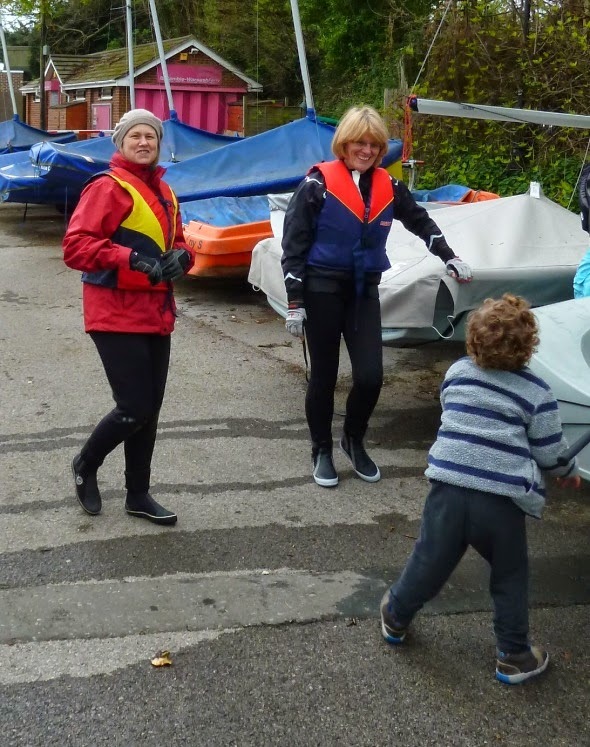 Later the following week Erica joined the WOW's and MOB's (Women on the Water, Men on Boats) on a very blustery, cold Tuesday evening . 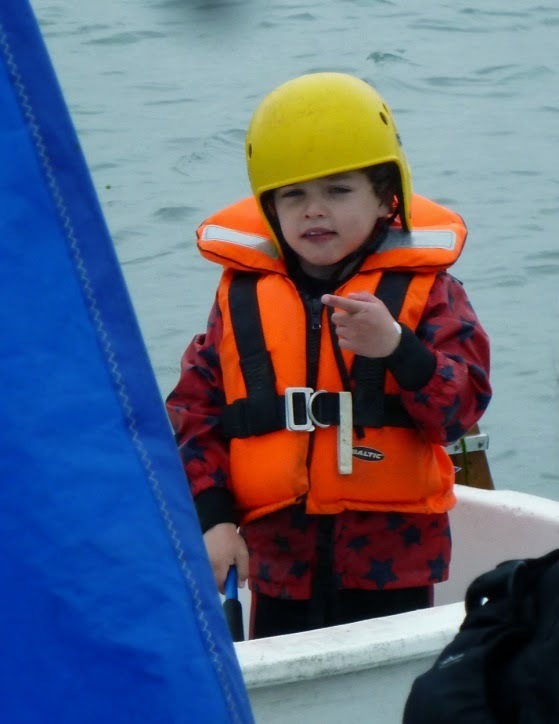 Joseph and I were on hand to rig the boats and generally help out, or was that get in the way? Despite the weather there was a good turn out with a couple of Lasers, 3 Picos and a Firefly. Erica, joined the crew on one of the clubs new RS Visions which looks a lot of fun. The two girls in the Firefly apparently had a great sail, so I'm being pressed to do duty with Erica in one of those next time, going to need a baby sitter! 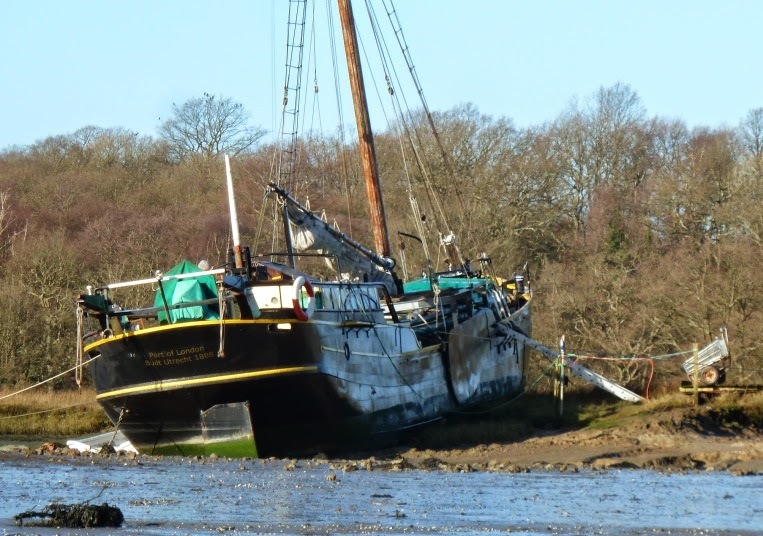 The tide had left the creek leading to Salterns Boatyard, leaving the houseboats were sitting high if not exactly dry on the exposed mud. None of the boats in this small community look to be local rather they all look to have originated in the Netherlands. Above the characteristic lee boards of a Dutch working craft, and below there's no doubt over the providence of this one, although registered in the Port of London she was built in Utrecht in 1888. Hurst Spit is a long shingle bank which stretches out into the Solent, enclosing and protecting the saltings and channels between Keyhaven and the famous Castle. 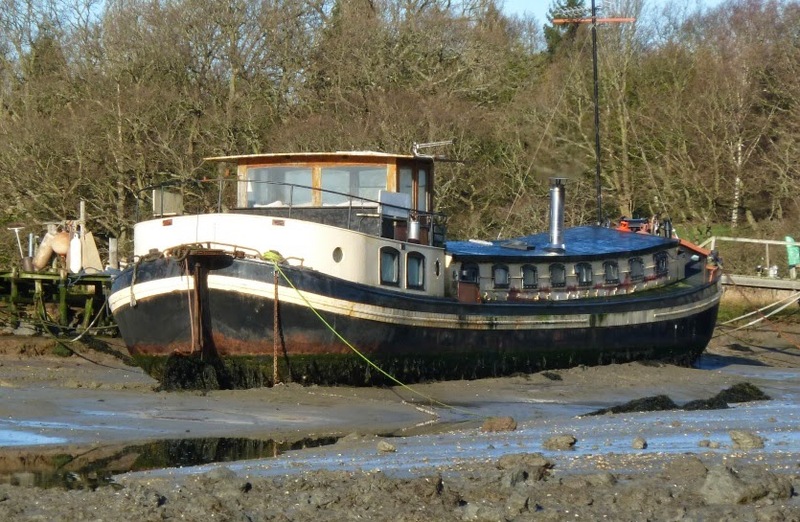 The narrow and often drying channels are crowned with moorings, but it’s still possible to anchor so back in the depth of winter we took the opportunity to observe the channels at low water and work out the best spots. There are very few spots like this still left in the Solent but what a great anchorage, imagine waking up on a clear bright morning, nothing around, smell of bacon coming from the galley, we have a spot marked out for a visit later this year. There are more than a few GRP displacement motorboats like this around, most can be had for not too much money, most have an inboard diesel and would make a comfortable if steady cruiser for the protected waters around the Solent. If there is one drawback it's probably some of the details, notwithstanding the overall shape of the cabin roof and dog house, details like the rubber fitted windows to me are all too reminiscent of kit cars in the 1960's and 70's (apologies to US readers that particular motoring phenomenon probably and fortuitously passed you by). 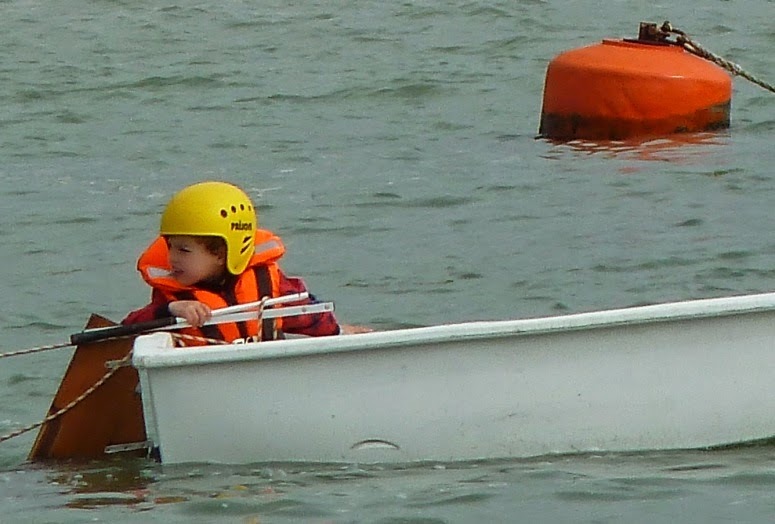 None the less a sound little boat. 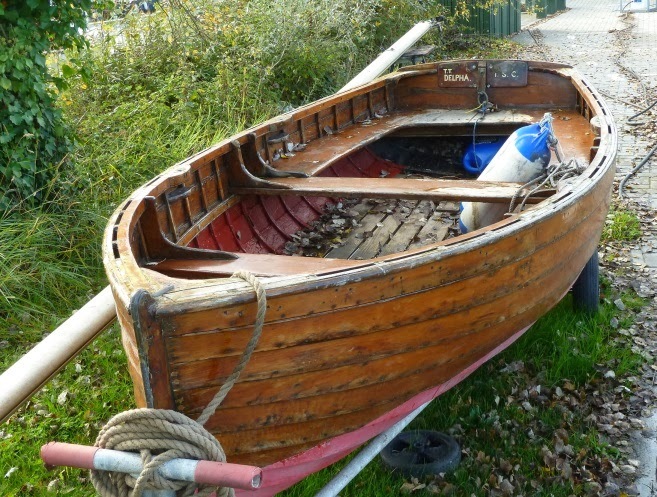 Over in Chichester I spotted this lovely wooden tender. 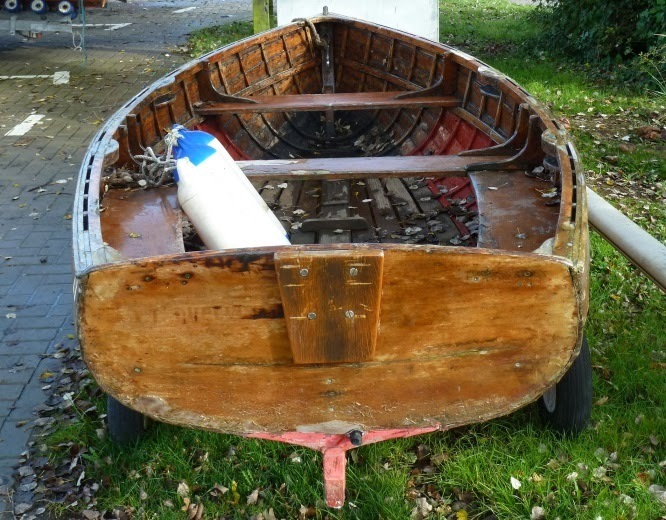 It's true that she would benefit from some tlc and a varnishing, but despite that her design speaks of safe and efficient yacht tender, clearly meant for rowing and able to carry a good load. 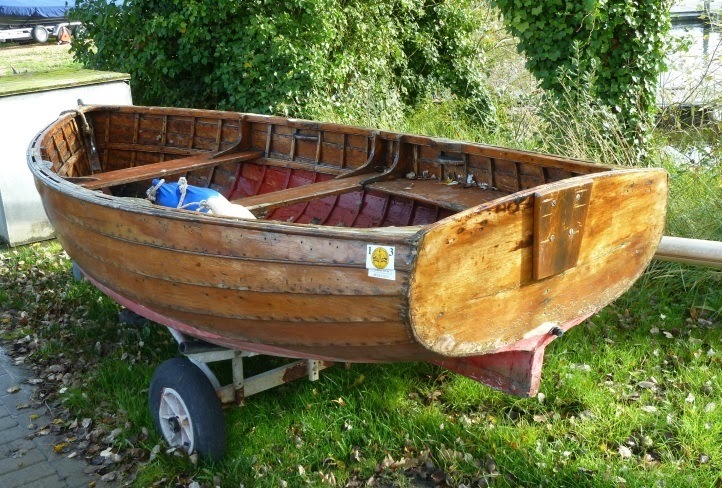 She is set up for two sets of oars but no sign of sailing rig. That pad for the outboard looks like a later addition. 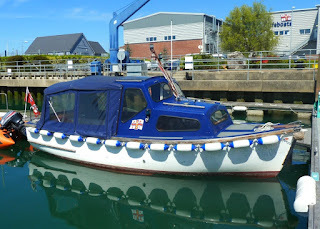 A few weeks ago Daughter Katy transferred to the Fleet Air Arm and started her training at HMS Saltern over in Gosport. For those not familiar with the British military the Fleet Air Arm is the navy air force. After a few years of more general shipboard duties Katy decided to train in aircraft engineering. Families were invited to go along to see the facilities which as well as seeing Katy was an opportunity too good to miss. The tour took us through the workshops have examples of the different helicopters the trainees will be working on. 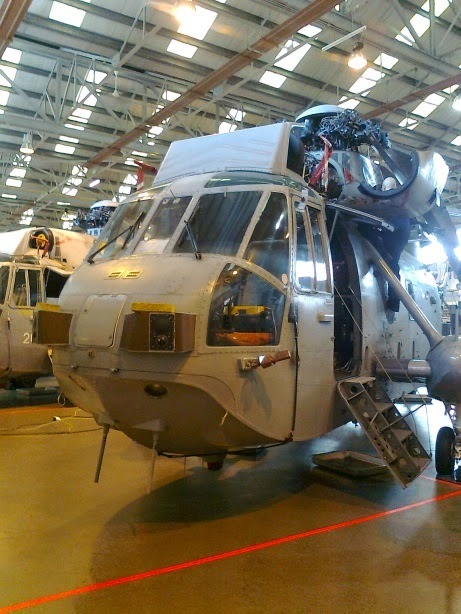 Not surprisingly most were retired aircraft, like these Sea Kings which were great to go aboard. 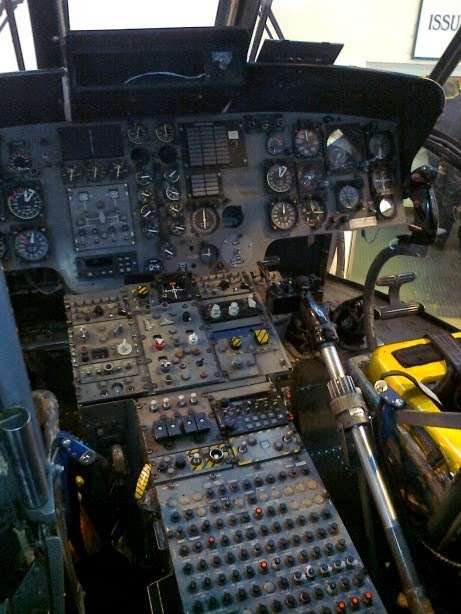 They are due to go out of service in the next few years and the modern replacements won't have anything like these old dashboard gauges and controls, the flight controls being replaced by computerised and head up displays. 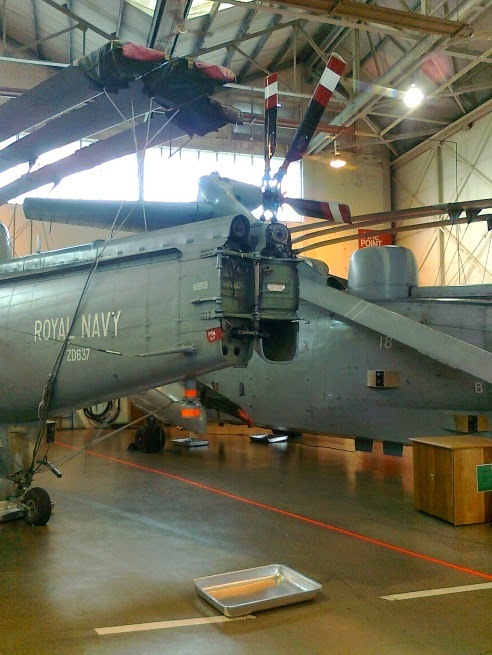 This was an interesting detail the tail including the rotor assembly fold for more effective storage aboard ships. At the top of the body section you can see a transmission coupling which takes power from the main engines to the tail rotor which is a nice reminder of how vital these components and their maintenance is. 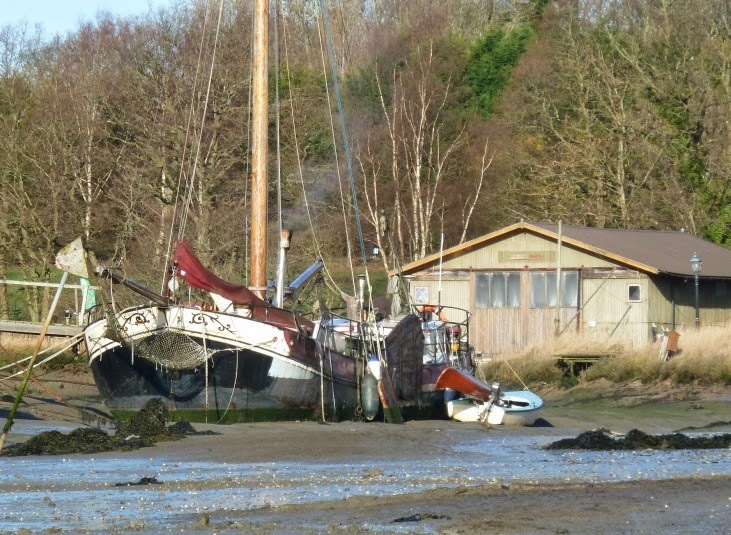 We have some great natural harbours and sheltered creeks around the Solent, but with the big tidal range so much is exposed as wet mud twice a day, putting deep water moorings at a premium. 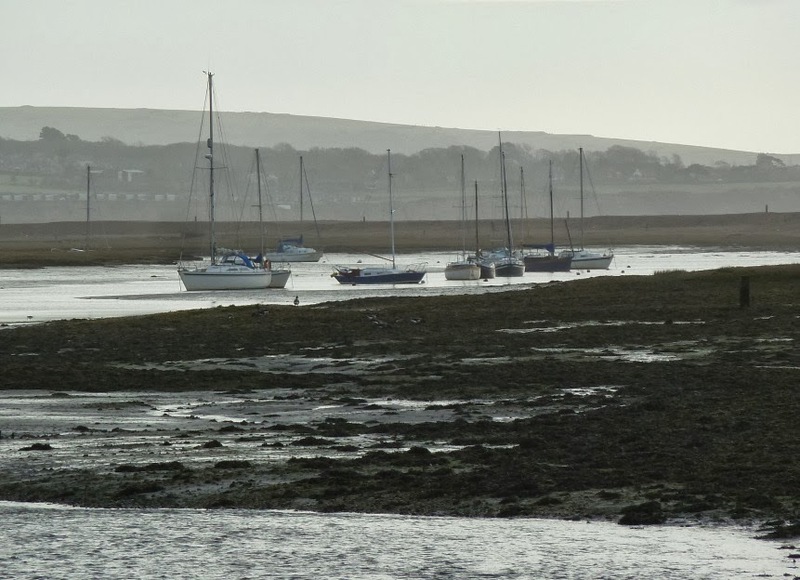 There are still plenty of mud berths or half tide moorings, but there in lies the problem, for half the time you can't actually get to and from your boat and when you can you have a limited time to sail or you have to stay away until the following tide come back. 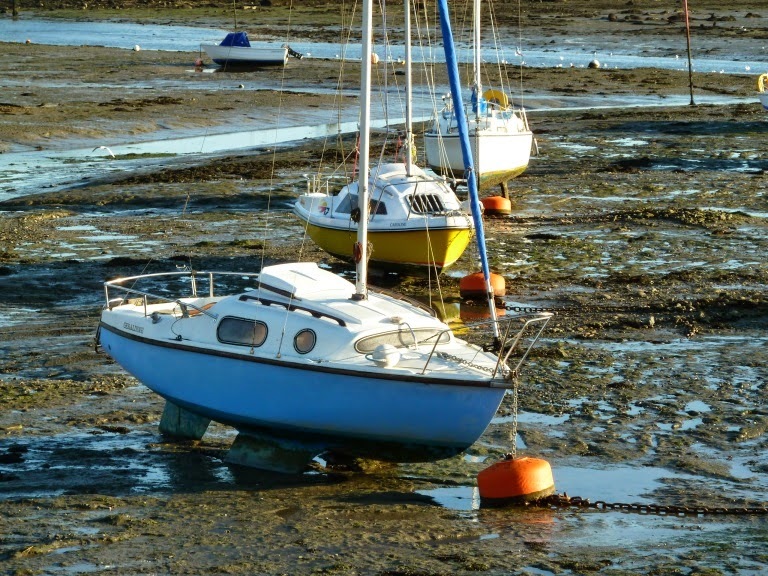 A shore side mooring at the top of a creek is somewhat better since you can get to and from your boat at any time for loading or repairs even if you can't sail. 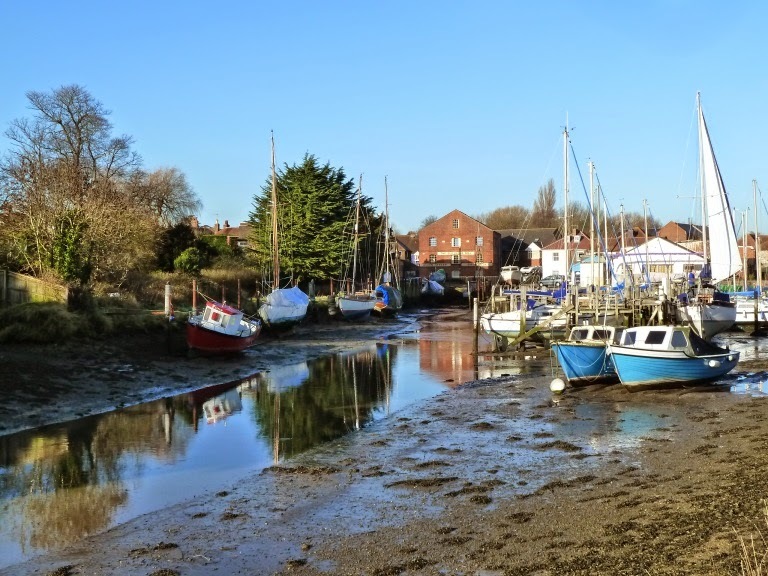 Below the moorings at Dolphin Quay in Emsworth are also nicely located close to the town for shopping and some comfortable nearby pubs while you wait for the tide to return. 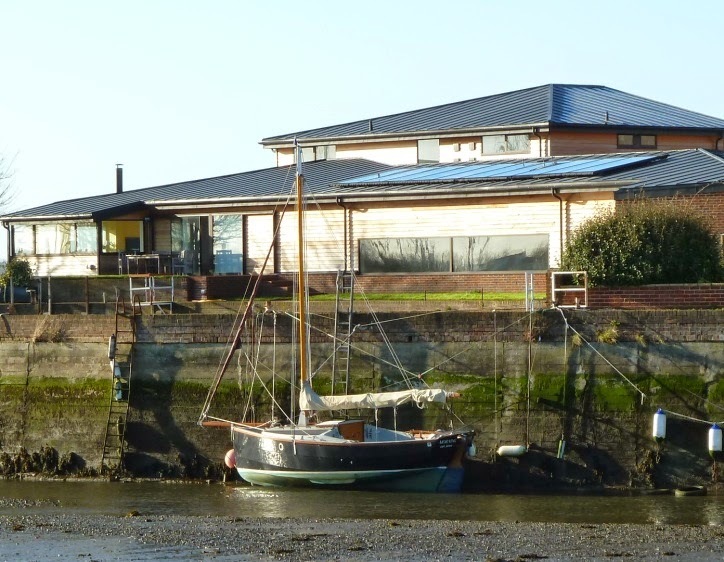 This is perhaps the ideal solution if you can find one and afford one, a creekside property where you can keep your boat at the end of the garden. This boat has been around since the end of last summer. 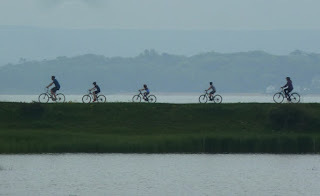 Intuitively it would seem to be more at home on the Canal du Midi rather than the tidal waters of the Hamble. 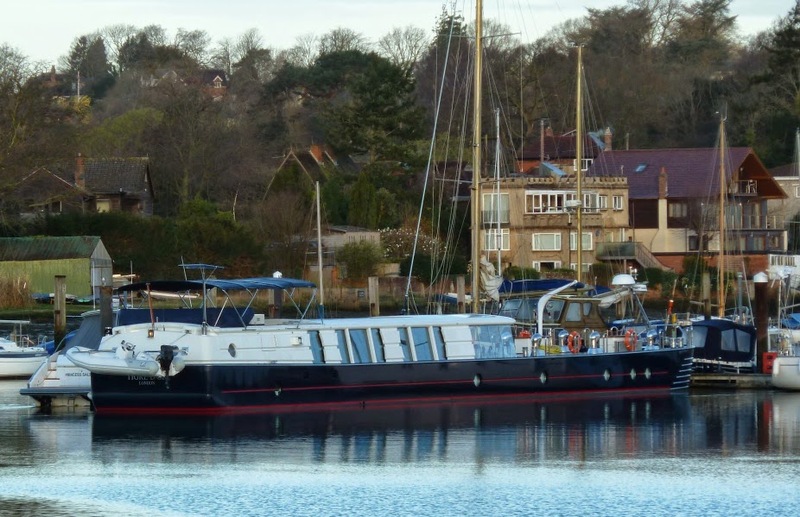 It's certainly going to provide spacious and luxurious accommodation, one can imagine sitting out on that huge fore deck on a balmy evening in the South of France, but if that is the intended destination some of that highly polished stainless steel might have a hard time going up and down the locks. 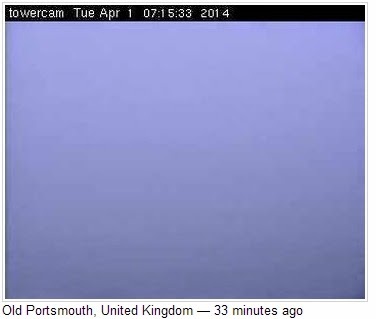 Over in Southampton Water over a mile or more away the ships are sounding their fog horns, the river is still or rather what you can see of it. To the east in Portsmouth things are pretty similar, it might be worth waiting a couple of hours before going up the Spinnaker tower to take in the views. 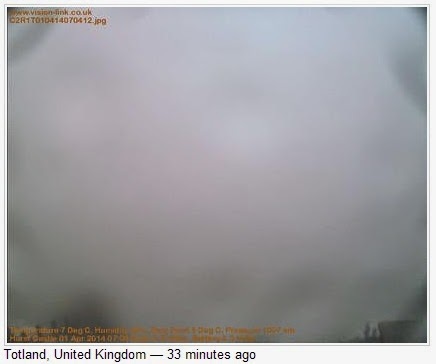 Down in the west it's the same, hopefully it will burn off by mid morning, when it does that normally means a bright and hot day, fingers crossed.